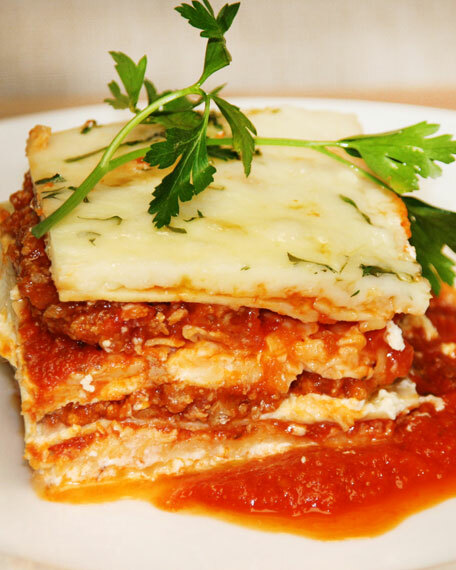 Flavorful mix of ground beef, pork, and veal layered with pasta, tomatoes, and cheeses. 3 lbs. Serves 4-6; approximately 8 ounces per serving. Ships frozen. Heat uncovered in preheated 325-degree oven for 25-30 minutes; let stand 10 minutes before serving. Perishable items are shipped to you directly from our vendors. Therefore, if you need to cancel an order, we must receive the cancellation at least four days prior to your requested delivery date. We added all garnishes as inspiration for your own presentations.Allergen Information: Contains wheat and dairy.